The picture garnered over 33k likes within a few hours. 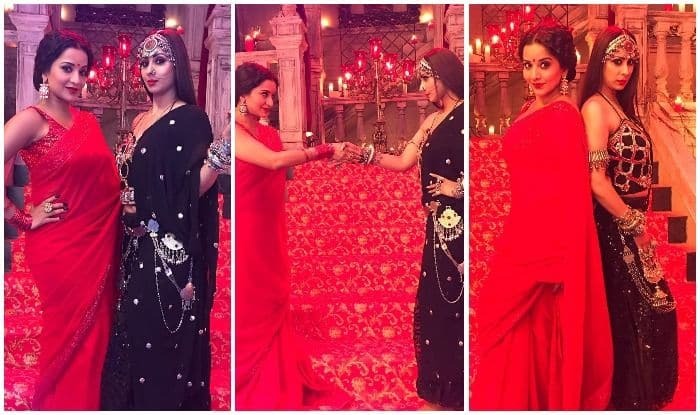 Garnering constant limelight for slaying it like never before with every new picture and video, Bhojpuri sensation Monalisa aka Antara Biswas is in news again for her smoking red hot look in the recent pictures from her Hindi television show, Nazar. Taking to her Instagram handle, television’s favourite daayan, Monalisa, shared a series of pictures with actress Sangita Ghosh from the serial’s sets and needless to say, both look too hot to handle. While Monalisa can be seen donning a gorgeous red saree, with her curly hair tied in a low bun revealing a pair of long earrings, Sangita wore a funky black-coloured one with a matching low-neck cropped-blouse. Both the actresses completed the look with a dab of luscious red on the lips, a set of matching colour bangles and rings. Sharing the pictures on her Instagram handle, Monalisa captioned it with a simple “sisters/girlfriends” emoji. While Monalisa was away from Nazar after her death in the show, fans were missing her and used to message her on her social media posts to come back to the show. Now, the hot bomb is coming back as a daayan and guess what? She will be seen along with Sangita aka Pishachini, who will be featuring in an upcoming supernatural series Divya Drishti. For the uninitiated, Monalisa is the mega-star of the Bhojpuri film industry. She has worked in over 125 films and acted in several language films such as Hindi, Kannada, Telugu, Tamil, Oriya and Bengali. Sangita, on the other hand, has worked in a supernatural show Sambhav Asambhav wherein she starred opposite Shakti Anand. She played the role of a woman who gets married into a family and discovers that she is the reincarnation of her mother-in-law.